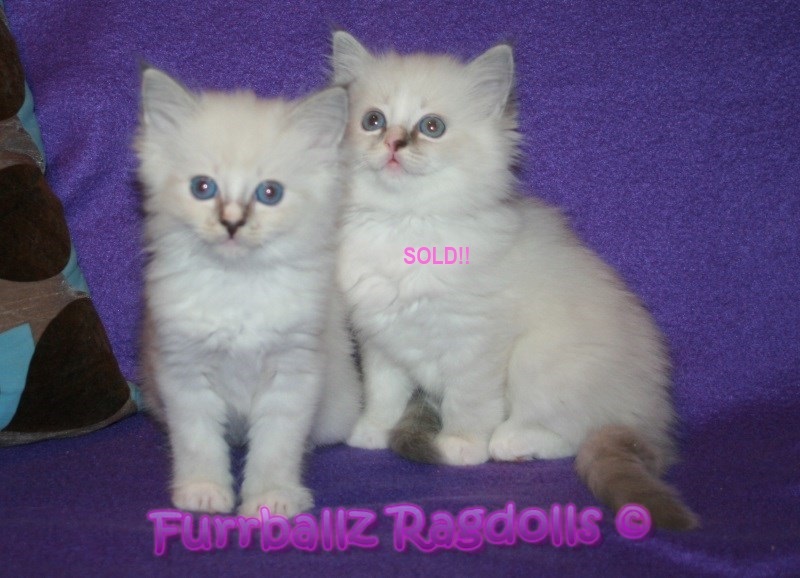 The kittens listed below ARE NOT FOR SALE! 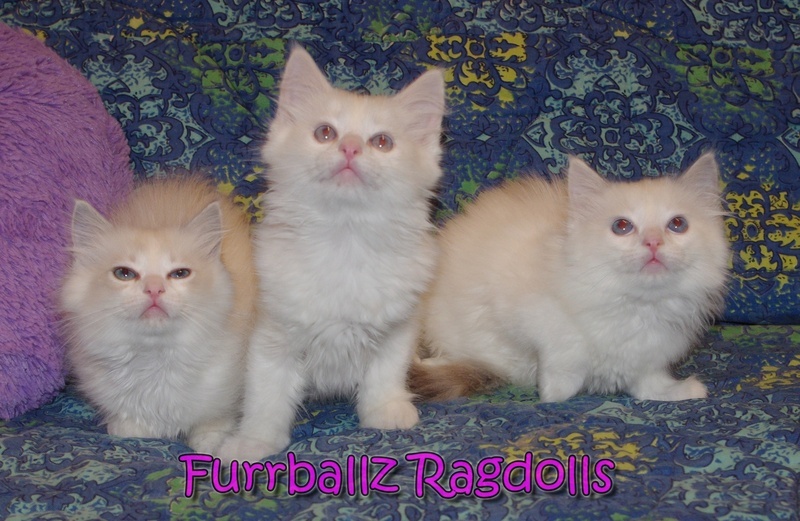 Please note that none of the kittens listed on this page are available for sale. This is purely a page to show-off the babies we have had born or have previously had in our care. 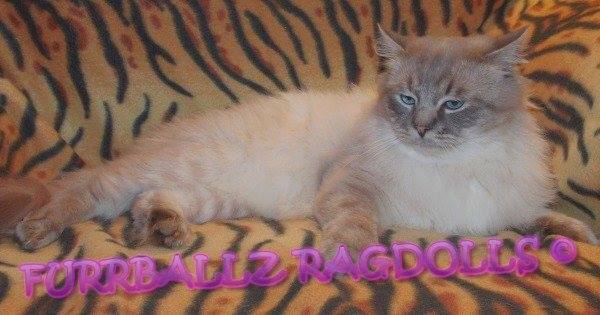 This was a long anticipated mating for us here at Furrballz. Kealani is our home bred miracle girl, as her Mum Glenda almost died soon after giving birth, and Kealani was the only remaining baby in the litter. We were lucky enough to get Caddy, the Sire, back into our cattery and we planned to make good use of his lines as we have retired his Mum, Tessa. Tragically, he and another of our Studs, were bitten fatally by a poisonous spider, only a few short weeks after coming to us here. 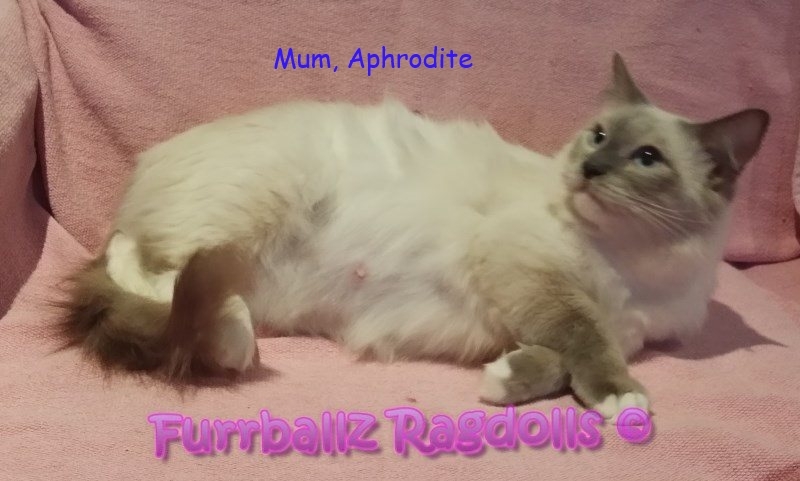 Kealani was the only one that fell pregnant to him, so we are keeping the one gorgeous Lilac Bicolour girl, to live on with us here at Furrballz. Pictured at birth and 7wks of age. 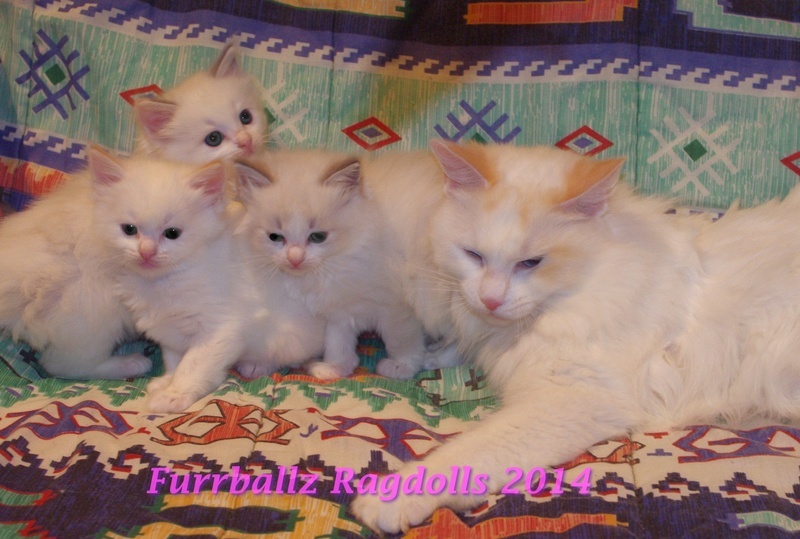 Our last litter from this mating grew SOOO well, we just had to repeat it! 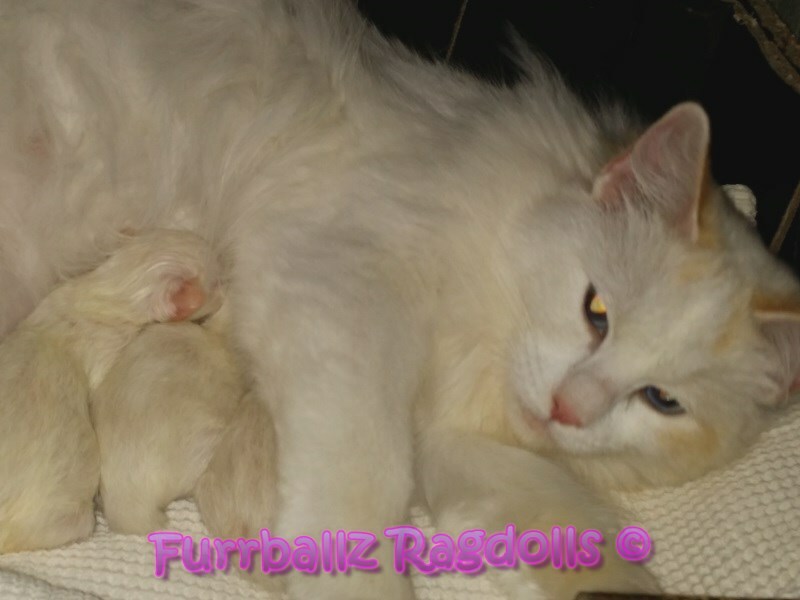 This time tho, Sunni decided to have a very small litter of only 3 gorgeous babies. 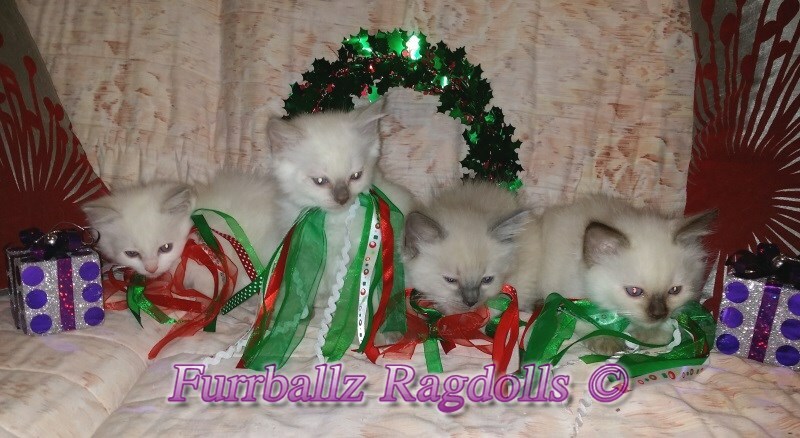 2 Stunning Blue Tortie Tabby Bicolour girls and a Red Bicolour Boy!! 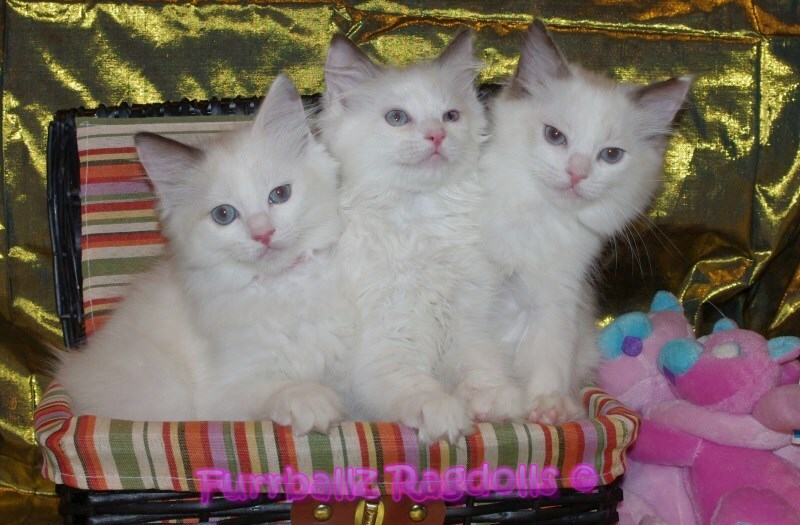 They are pictured at birth and 10wks of age. 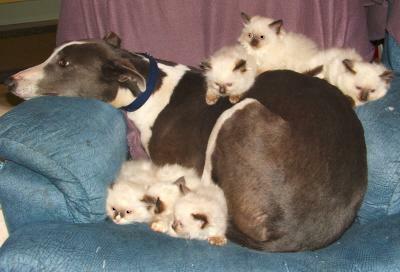 This is our special home-grown boy's litter. Daegan is from our lovely (now retired) girl, Opal! He is a very proud Dad! 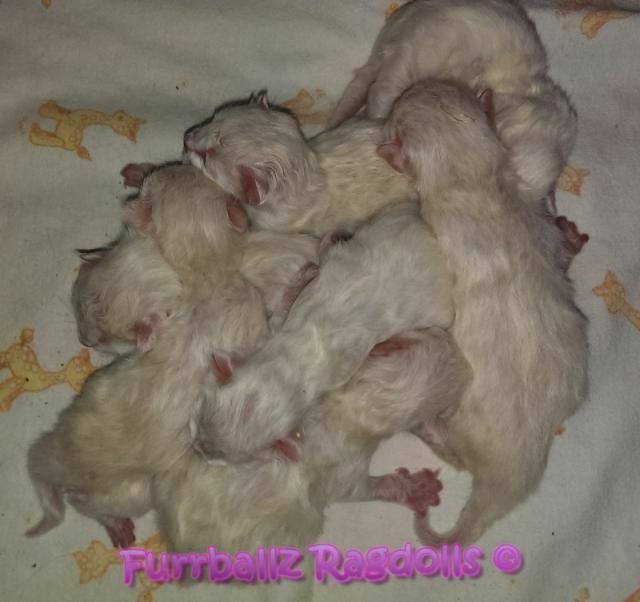 Kellye has raised her Six scrumptious bubs very well!! 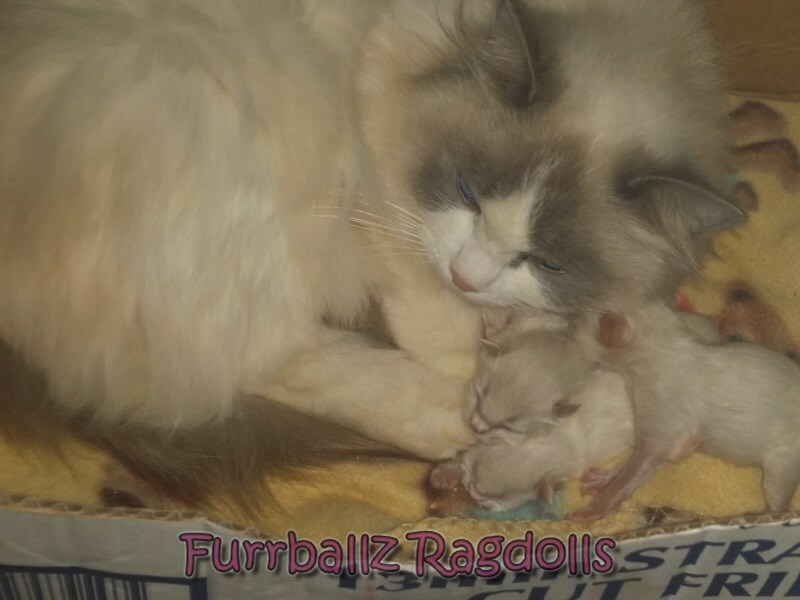 She proudly had 2 lovely boys, one Blue Point and a Lilac Mitt and 4 gorgeous girls, one Choc Tabby Point, a Lilac Point, a Chocolate Point and a Lilac Mitt with Blaze. 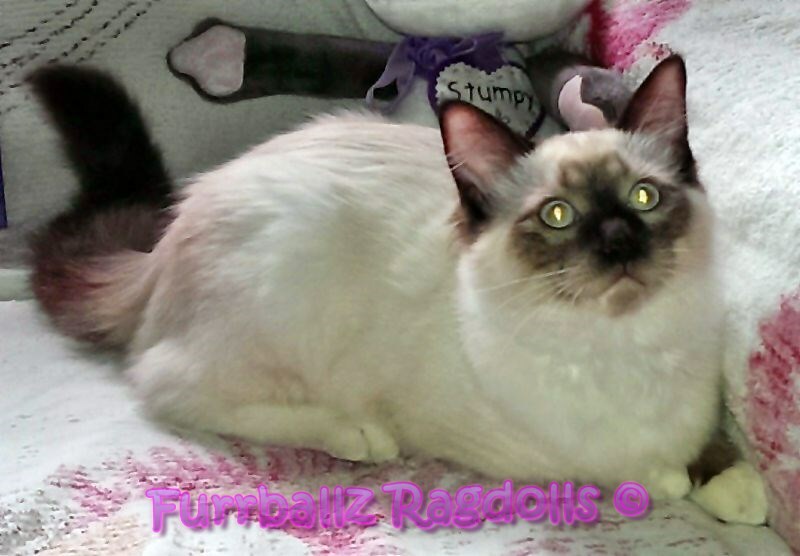 Furrballz Aphrodite was another gorgeous home grown girl that has given us a heart attack over her antics! We almost lost her a year ago when she played with a spider that bit her in her mouth!! A very expensive vet visit and loads of care later, she survived and went on to winning Best Group 1 Adult in her very first show!! We mated her to our gorgeous studly boy Thief and she quietly gave birth to SEVEN gorgeous cottonbuds!! 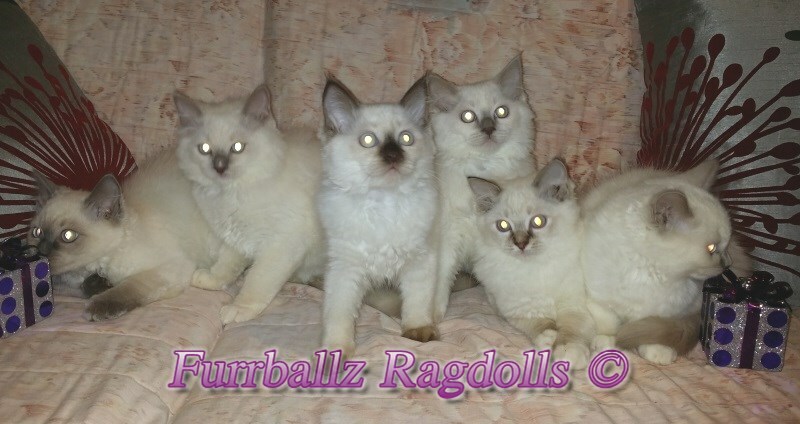 Dite had 5 gorgeous Blue Mitt boys and 2 Blue Tabby girls!! 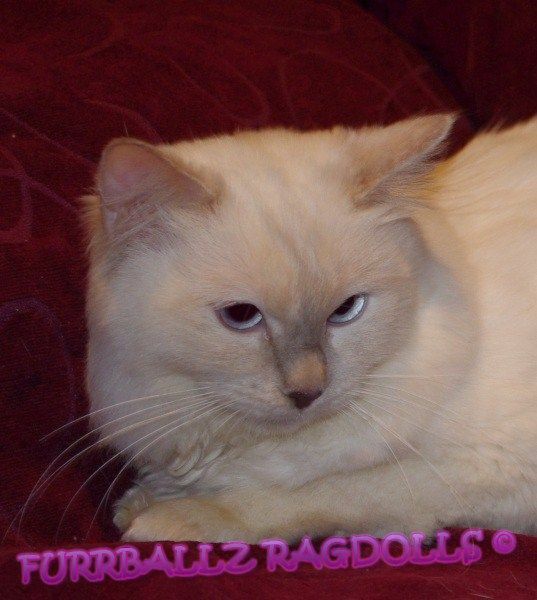 Lolli, our homegrownLilac Tortie Point girl, was also mated to Marty, Sandy's Lilac Bicolour boy. 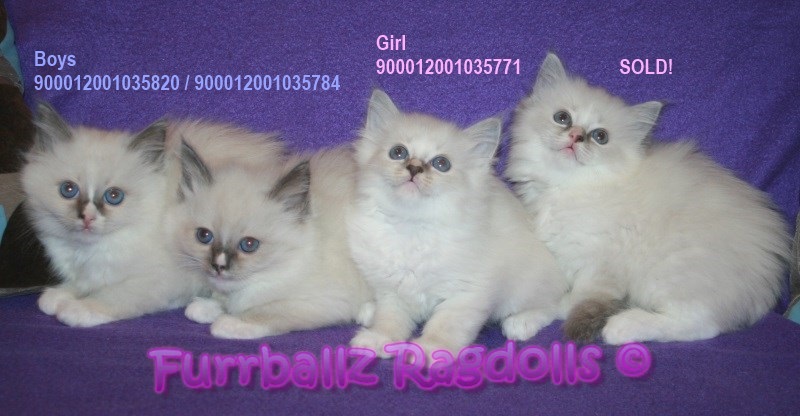 We know that all kittens will be Lilac Cream Torties for the Girls, and Creams for the Boys. Pattern will be either Bicolour or Point. 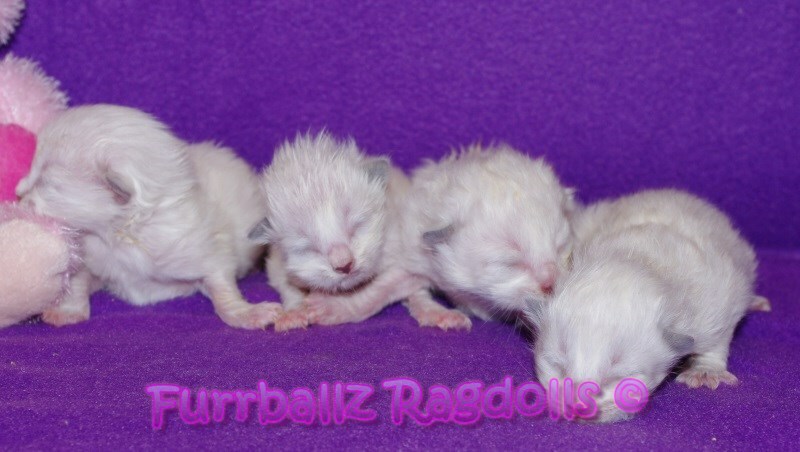 The remaining 3 babies thrived and we have kept one of the girls, the Lilac Bicolour girl. Tessa's last litter before being retired, had to be a special one. 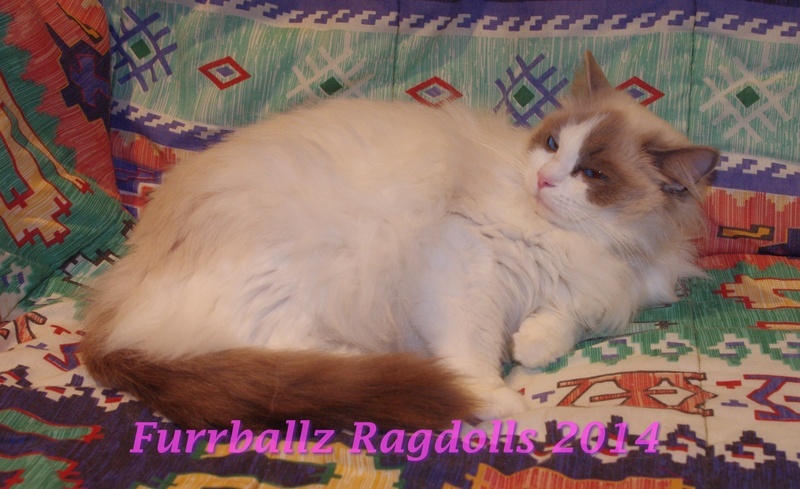 As she is a dominent Chocolate girl, we chose a Lilac Bicolour boy called Marty, to be her litters Sire, owned by my friend Sandy at Dandy Ragdolls. This mating ensured that any kittens kept for breeding, would carry dilute, unlike Tessa. She has raised her remaining Six bubbies with her usual fantastic attitude and care! Opals last ever litter as she has well and truly earnt her retirement over at a friends home, so we can continue to visit her. 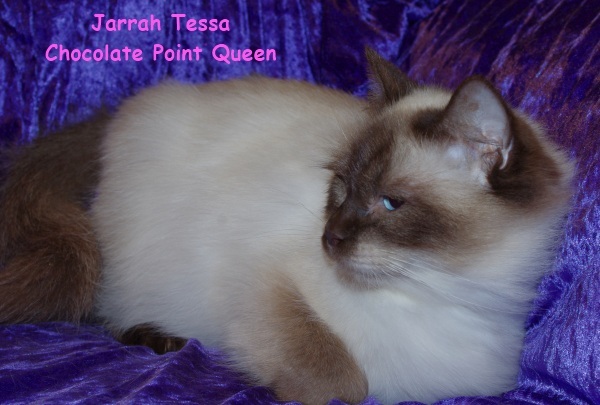 Again, my long-suffering breeding friend in QLD, Kerry of Jipsiglenn Ragdolls, was nice enough to keep hold of Opal above and beyond for mating, as she must have realised it was the last time she had to ... umm ... 'play up' and just had to visit with not one boy... but TWO as the first boy didnt 'do it' enough for her to get pregnant. So she eventually came home to us, settled in like she has never been anywhere else, and then quietly gave birth when it was time, to 2 Girls and 2 Boys! Kellye is a home grown gorgeous girl that has done very well on the show bench last year. She is also one of Thiefs' gorgeous babies! 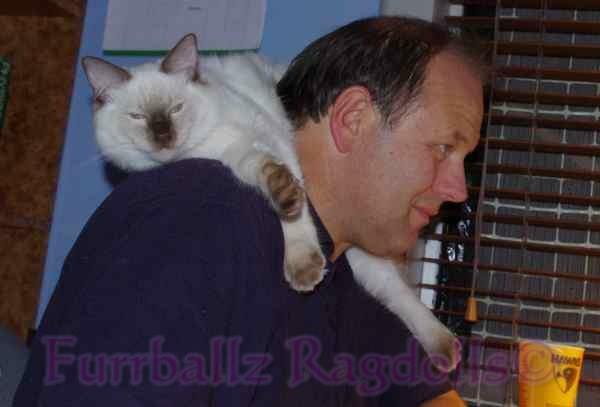 We decided as she is a Lilac Tabby, we would place her with our experienced Seal Bicolour boy, Roane. 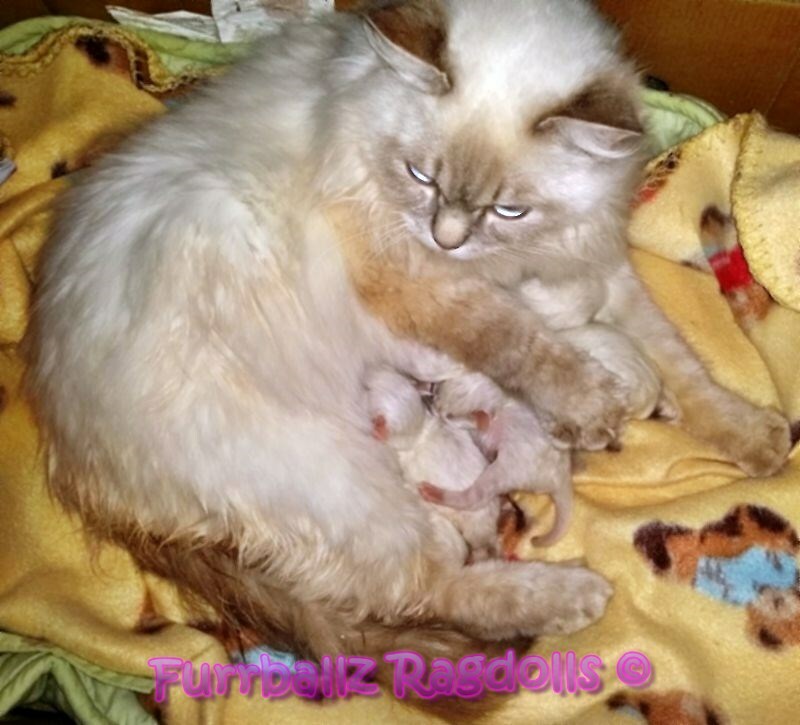 Kellye surprised us all with birthing and raising a litter of SIX for her first time as a Mum!! 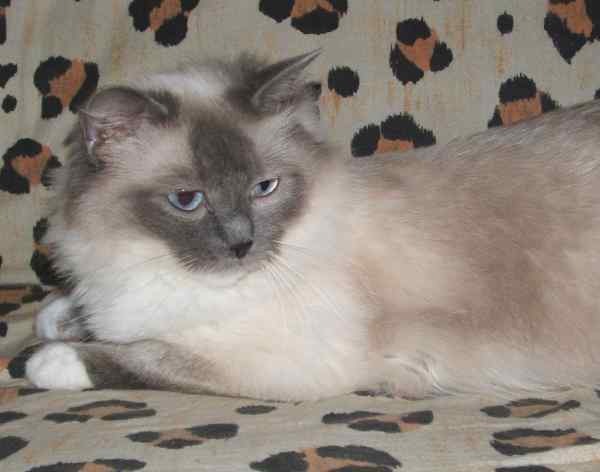 We did have 2 Gorgeous girls, but sadly the Blue Point girl faded, despite our best efforts and passed away. This left us with 4 Handsome lads, 2 Chocolate Points, a Blue Bicolour and a Seal Bicolour and a Lilac Point girl that all have gone from strength to stength. 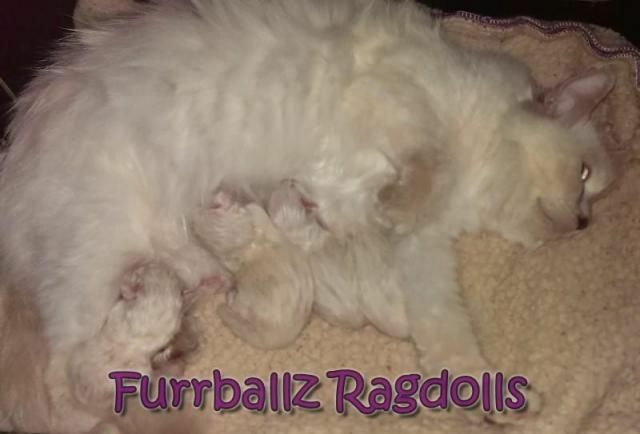 Our gorgeous Red Bicolour girl, Sunni, was able to while her feminine ways around our Bear and the resulting litter was two stunning boys, One Red Point and One Red Bicolour, and 4 gorgeous girls! 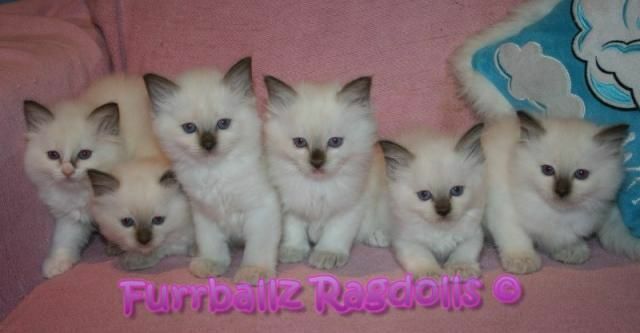 3 Seal Tortie Bicolours and a Blue Tortie Bicolour. One gorgeous Seal Tortie Girl is still available and is advertised on the Available Kittens Page, along with her M/Chip number. Lollie and Thief... a match made in heaven! We knew what the patterns would be before they were born as both parents are Pointed, so that part was easy, We also knew we would only get Lilacs, Blues, Creams, Tabby and Tortie. We werent disappointed! 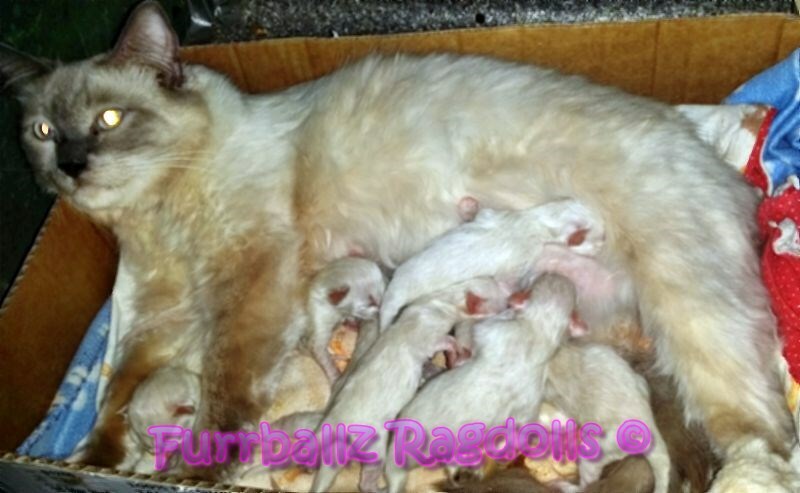 SIX gorgeous bubbas were safely born, 5 Handsome Lads, 1 Blue Tabby, 2 Cream and 2 Lilac... and 1 lovely Lilac Point girl! 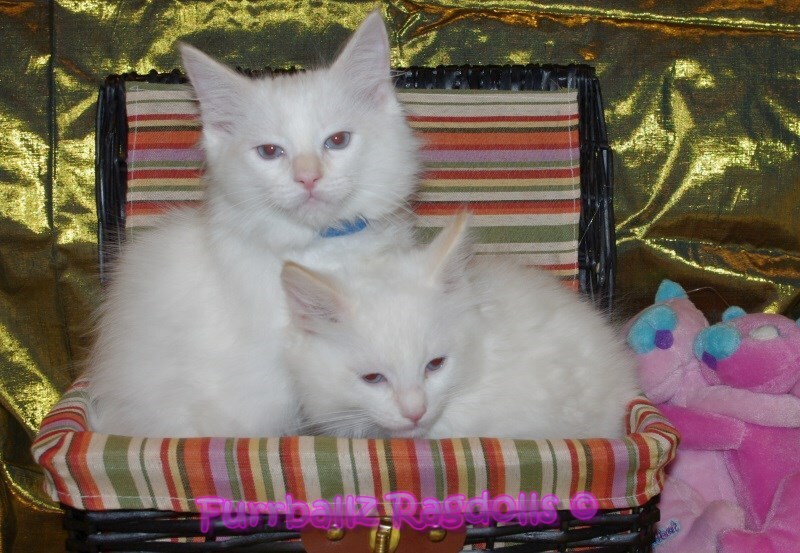 All our Kittens sold as a pet or as a pet/show cat, are desexed and vaccinated before leaving our home, to give YOU, the pet owner the best adjusted kitten possible, with the easiest transition from our home, to yours. 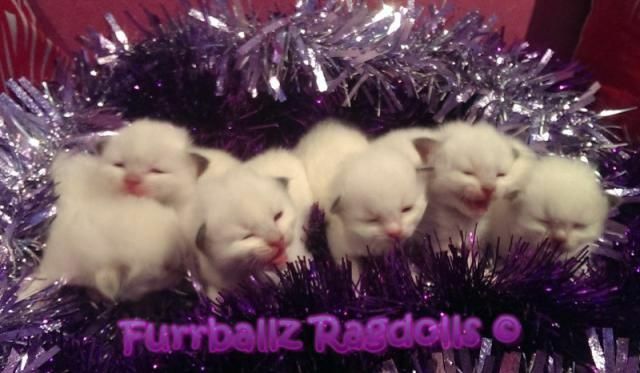 We also include a kitten food pack and information kit with every kitten/cat bought thru us and a lifetime gaurantee that we are interested in the kittens growth and progress. If you have ANY problem after taking your kitten home, WE want to know of it. After all...we may have the solution you are looking for! We prefer our kitten buyers to be as informed as they can be, so we encourage any and all questions from you. We believe that YOU need to be as comfortable with US as we need to be with YOU! 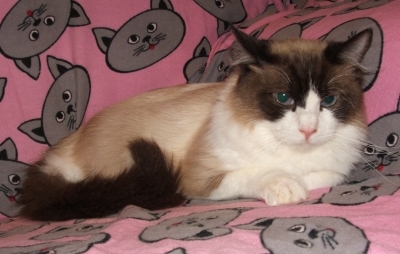 Unlike the dog world, cats can be shown as neuters (desexed) and they are eligable for all prizes any other cat in the show is. 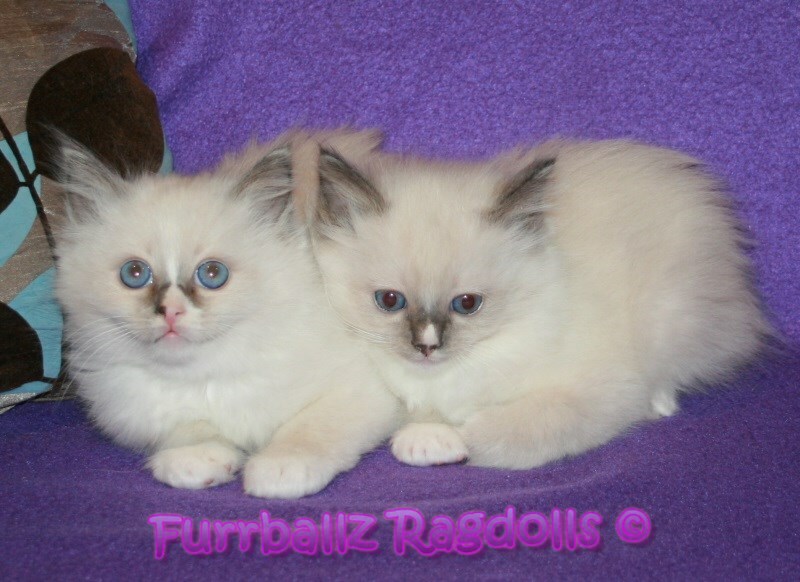 If you are interested in possibly showing your new addition, please discuss this possibility with us before falling in love with a particular kitten, as we will want to guide you in choosing the best possible kitten for the show ring. 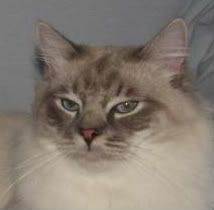 We take care to do all we can in helping out new people to the hobby of showing cats, and we will not knowingly sell you anything that we would not be happy to place on the show bench ourselves. If after purchasing a kitten/cat from us, you find yourselves in a position of being unable to continue with caring for the cat/kitten, please contact us IMMEADIATELY so we can either take the cat back, or help in the re-homing of the cat, REGARDLESS of the cats age. As far as we are concerned, when you receive a cat from us, this does not stop our responsibility for its lifetime happiness and we are always interested in hearing from our furry friends 'parents'. Pets are for life...not just for a present, Christmas or while they are 'cute'!